After 10 minutes, remove the lid from the canning pot. I use two tongs to grasp the handles and lift the rack back up to that first notch on the handles. Be sure to watch for steam when you go to remove the lid, as it can burn you. Raise the jars back up and place the handle notch back on the rim of the canning pot. 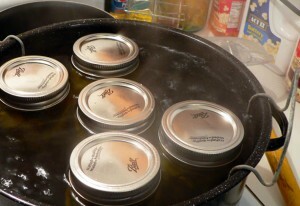 The jars need to sit here and rest for about five minutes before removing them from the canning pot. You may start to hear that lovely sounding “ping” as the jars start to seal. I think that’s the most fun part of the whole process. I get a kick out of counting how many I hear. Sometimes they will seal much faster than others. And at other times, you will not even hear that familiar sound; though that doesn’t mean the jar hasn’t sealed. You have to wait 24 hours to be sure it did though. After five minutes, use the jar lifter again, and carefully remove the jars from the canning pot. The hot jars should be placed on a folded towel in a draft free location for 24 hours. You must resist the urge to press on the top center of the jar to see if it sealed for this amount of time. You may be able to look closely at the jars and see if the center portion is up or down but do not press on it.